The U.S. Army Rangers tackled some of the toughest missions of World War II and became combat legends. On a June morning in 1942, a battalion of American soldiers stepped down from a train at Fort William in the northern highlands of Scotland. Bagpipes of the Cameron Highlanders’ band sounded the call to battle, and the Americans were greeted by Lt. Col. Charles Vaughan, a burly, ruddy-cheeked British Army officer. Radiating enthusiasm and goodwill, he welcomed the Americans to Scotland and told them he would lead the way to Achnacarry Castle, site of the British Commando training depot. The GIs slung their rifles and packs, formed a column, and followed the band up a hilly road. Heartened by the skirling of the pipes, the Americans strode toward misty blue hills in the distance. The road grew steeper and feet began to drag after the first mile or two. On the Americans marched, mile after mile, as their packs seemed to grow heavier and sweat trickled down their backs. The band played louder, as if to encourage the GIs, and Colonel Vaughan marched steadily ahead. Feet began to blister and the Americans groused to themselves, but they dared not fall out. They were all volunteers and had made a choice for action with a new, elite unit. They were members of the U.S. 1st Ranger Battalion, recruited earlier that month in Northern Ireland from among the 34th Infantry Division and the 1st Armored Division. Their leader was a lean, young West Pointer from Arkansas named William Orlando Darby. He marched resolutely ahead, setting an example for his men to keep up the pace. On the column marched through a picture-book landscape of forested mountains, tangled undergrowth, lakes, and cold streams plunging down steep glens. The Camerons’ bagpipers skirled, and the weary Americans struggled on. At last, after 14 miles, the ancient turrets of Achnacarry Castle came into view, and then its vine-clad walls and emerald lawns. They had made it. Colonel Vaughan praised the GIs on their marching and, with an impish grin, promised them more of the same in the future. The Americans rested and then toured their new home where they were to undergo training with the legendary British Commandos. 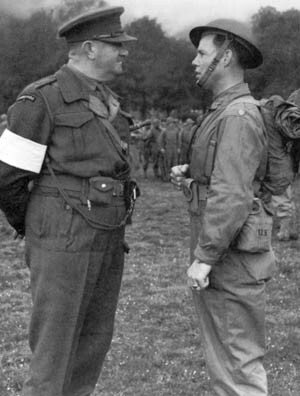 Major William Darby of the Rangers (right) talks with Lt. col. Charles Vaughan, head of British Commando training, in July 1942. The Rangers began their training without delay, and the Commandos did all they could both to make them feel at home and to find out what sort of men they were. At the depot were also Free French and Dutch soldiers, as well as Commando veterans of the ill-fated Norway and Lofoten Islands campaigns, numerous hit-and-run raids on the European coasts, and some who had escaped from Singapore and Somaliland. Colonel Vaughan’s personality dominated the depot. A former drill sergeant in the crack Coldstream Guards and an officer in World War I, he had served as deputy commander of No. 4 Commando during the Norway raids in March 1941. He was tough but fair, and exacted maximum effort from his trainees. Vaughan and Darby quickly grew to like and respect each other, although some of the Britons harbored doubts about the stamina of the Americans. William Darby was born on February 11, 1911, in Fort Smith, Ark., where he had a typical small-town childhood. He was a Boy Scout, part-time delivery boy, churchgoer, and avid reader. In high school, he displayed a flair for leadership and also seemed to be a born salesman. Friendly and willing, he was a handsome youth with blue eyes, a high forehead, a firm jaw, and a ready smile. Young Bill decided on a military career, but it was not easy to secure appointments to the U.S. Military Academy in the 1920s. The Darbys persuaded their local congressman to recommend their son as a second alternate candidate. The young man eventually won a nomination and was admitted to West Point on July 1, 1929. Darby became an enthusiastic member of the Long Gray Line. He was an exemplary cadet and a conscientious student, showing a fine balance of mental ability, leadership, and personality. He became a cadet company commander in his first class year, and was active in soccer, the glee club, 100th night shows, and as hop (dance) manager. When he graduated on June 13, 1933, with a bachelor of science degree, he stood 177th in a class of 346. He was commissioned a second lieutenant in the field artillery. Darby served with the 82nd Field Artillery Regiment, the only horse artillery regiment left in the Army, and fulfilled assignments in New Mexico, Texas, Oklahoma, Kansas, South Carolina, Georgia, Louisiana, and Iowa. He gained experience as a troop leader, took school courses, and was rated as a superior young officer on his efficiency reports. In October 1940, at the age of 29, he was promoted to captain. Early the following year, Darby was chosen to learn about amphibious warfare by taking part in a joint Army-Navy training operation in Puerto Rico. In November 1941, he was assigned to duty in Hawaii, but after the Pearl Harbor attack, he was reassigned as aide to Maj. Gen. Russell P. Hartle, commanding the 34th Infantry Division. The division sailed for Northern Ireland in January 1942. Early that May, Darby, itching for action, requested a transfer. It was turned down, but his chance was coming. While the division had been training in Ulster, General George C. Marshall, Army chief of staff, had visited the Achnacarry depot and decided that an American commando force should be formed. It would be called the “Rangers,” after the famous hit-and-run raiders led by Major Robert Rogers in the French and Indian Wars preceding the American Revolution. Marshall wanted U.S. troops to gain combat experience before the eventual Allied invasion of continental Europe. Lord Louis Mountbatten, chief of British Combined Operations, agreed to allow the Americans to train under his Commandos in Scotland. General Lucian K. Truscott, Jr., implemented the project and authorized Hartle to raise the first American commando unit. Darby was assigned to it, and the 1st Ranger Battalion was activated on June 19, 1942. Notices were pinned on bulletin boards at the American camps in Ulster inviting GIs to sign up for adventure and a hardy life in the new Rangers. Darby set up a headquarters in Carrickfergus, 20 miles north of Belfast, and spent almost two weeks interviewing officer volunteers and about 2,000 enlisted men. Only those in good physical shape with athletic ability, stamina, and good judgment were chosen. The original 1st Battalion comprised 575 officers and men organized in a headquarters company and six line companies. Truscott and Hartle took a special interest in the new unit. The volunteers ranged in age from 17 to 35 years and came from all parts of the United States. There were few regular soldiers and Darby was the only regular officer. The first Rangers included a Golden Gloves boxing champion, a bull fighter, a lion tamer, a wrestler, a professional gambler, a jazz trumpeter, a burlesque stagehand, a hotel detective, a Hollywood screenwriter, a church deacon, cowpunchers, American Indians, and a Cuban who was a machine-gun expert. They were a tough bunch, but Colonel Vaughan’s grueling 12-week training course at Achnacarry was a rude awakening for them. They marched, ran, and climbed over the moors, up cliffs, and across frigid rivers as charges exploded in the water and live rounds were fired at them. Darby pushed them on, and Colonel Vaughan told the Americans, “It’s all in the mind and the heart.” After an unimpressive first 10 days, according to a British instructor, the fledgling Rangers “got with it.” They mastered a tough assault course, crawled across rope bridges, scaled cliffs, and paddled across the lochs while instructors fired machine guns at them. They learned to kill with a twist of rope, a knife, or their boots or bare hands. They trained to fire a weapon accurately on the run, march 14 miles in just over two hours, build shelters from tree boughs, make a cooking fire that gave off little smoke, and to butcher and cook a doe in the woods. Some trainees even cooked and ate rats. Most important, the Rangers learned the value of stealth and surprise in combat. The Commando training was rigorous and realistic (40 recruits were killed at Achnacarry during the war). The Americans adopted the Commandos’ methods and added some of their own. They specialized in night fighting, sleeping by day and rising at nightfall. They sat for an hour in darkness to adjust their eyes, and learned that you can hear distant sounds better if you stick a bayonet in the ground and put your ear to it. 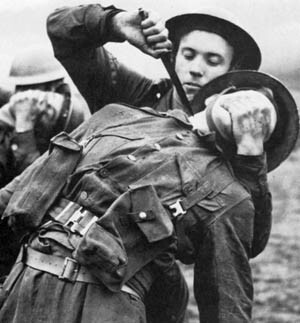 Commando trainees practice silencing an enemy sentry. After the Rangers completed their course, they were sent to a bleak island in the Hebrides for the “most miserable part of the training.” They endured driving rains, cold nights, and Royal Navy rations. There was some inevitable brawling between the Americans and British servicemen in the inns, the most notable being a 48-hour donnybrook during a leave in Oban. The Rangers did not fight with the Commandos, who by now were their comrades in arms, but there was resentment among the British because the Americans were paid twice as much. Some Britons were sure that all Rangers were paroled convicts. Eventually, the Americans were happy to move into civilian billets in Dundee. Of the Americans who went to Dieppe, one British officer observed, “Everyone liked them and enjoyed their company.” That month, Darby was promoted to lieutenant colonel (temporary). Darby’s 1st Ranger Battalion officially went into action for the first time in Operation Torch, the November 1942 Allied invasion of North Africa. The Western Task Force, commanded by Maj. Gen. George S. Patton, Jr., comprised infantry units and elements of Maj. Gen. Ernest Harmon’s 2nd Armored Division. The Central Task Force going ashore at Oran was led by Maj. Gen. Lloyd Fredendall and included the 1st Infantry (“Big Red One”) Division and Darby’s Rangers. At Algiers, the landing force included a British infantry division, a U.S. regimental combat team, and three British Commando units. A total of 107,000 Allied troops took part, landing along the French North African coast from Algiers to Casablanca. After rehearsing for a major landing, Darby’s battalion had sailed from Glasgow aboard Royal Navy ships and joined a convoy from the United States. The Central Task Force’s objective was the coast between Oran and Arzew. The plan was to land the 1st Division with the 16th and 18th Infantry Regimental Combat Teams at Arzew Bay and the 26th Infantry Regiment west of Oran. The Rangers were to land at Arzew, 30 miles east of Oran, and capture two coastal batteries, thereby ensuring for the Allies the port of Arzew and the naval base at Mers-el-Kebir. A haze veiled the North African coast as the Rangers and Commandos began to land at 1 am on November 8, 1942. Colonel Darby led his men through the surf and up a steep cliff path. He had decided to split the 1st Battalion and attack the two batteries simultaneously. Four companies under his command would hit the larger Batterie du Nord on a hill overlooking Arzew Bay, while the other two companies under his executive officer, Major Herman Dammer, attacked the smaller Fort de la Pointe at the harbor’s edge. The Rangers were tense and ready for action. Colonel Darby wondered how the Vichy French defenders would respond to an attack by Americans and gripped his trusty Springfield rifle. All Ranger officers carried rifles to make themselves indistinguishable from their men and not present special targets to enemy snipers. While Darby led his four companies toward the Batterie du Nord, the Dammer force disembarked from five landing craft and converged on the harbor fort from two directions. All was quiet ashore as the Rangers stealthily cut through a barbed wire fence, overpowered a curious French sentry, and poured into the fort. After 15 minutes and a few quick shots, the Americans captured the batteries and a 60-man garrison. Even the wife of the post adjutant was captured. Darby’s force trekked four miles from its landing beach over bluffs, along a coastal road, and up a ravine behind the Batterie du Nord. The Rangers had to seize the fort swiftly, otherwise they would be caught in Allied naval gunfire which was scheduled if the position was not captured. The Rangers cut through barbed wire and, supported by fire from light machine guns and trolley-borne 81mm mortars, dashed across open ground to seize the fort. Several men pushed Bangalore torpedoes into the muzzles of the fort’s big guns, others tossed grenades into ventilators, and still others barged through the main entrance, shooting a sentry. Sixty French defenders came out with their hands raised. Major Dammer, meanwhile, radioed that he had taken his objective. Darby was jubilant. The action had cost only two dead and eight wounded through token resistance, and the Rangers had acquitted themselves admirably in their baptism of fire. At 4 am, four green Very lights shot into the sky from the Batterie du Nord to inform elements of the 1st Infantry Division five miles out to sea that the forts at Arzew would not hamper their landing. As planned, the signals were supposed to be followed by four white star shells. These, however, had been lost during the Rangers’ landing. Colonel Darby grew nervous; he did not want his men endangered by naval gunfire. Eventually, he persuaded a Royal Navy forward observer party to signal a British destroyer, and she in turn transmitted the message to the American forces. Maj. Gen. Terry Allen had already started moving his 1st Infantry Division units when he saw the green flares, and by dawn the 16th and 18th Regimental Combat Teams were ashore. Darby’s force captured more French officers and men, and Dammer’s soldiers cleaned out snipers in the harbor area. Sniping went on for three days, and when a French 75mm battery began firing at an Allied ship in the harbor, the Rangers stormed it. With Arzew in Allied hands the fighting moved inland. A Ranger company joined the 16th Infantry along the coast, while the rest of the 1st Ranger Battalion stayed in Arzew. Colonel Darby even acted as mayor of the town for a while. 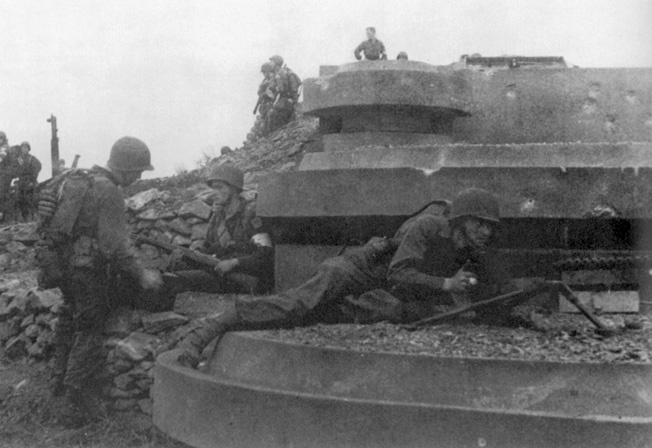 Members of the 1st Ranger Battalion guard a captured gun position in Algeria. The Rangers captured the two forts overlooking the harbor at Arzew just prior to the Allied invasion of French North Africa. When the 16th and 18th Regimental Combat Teams met stiff opposition at the villages of St. Cloud and La Macta, the Rangers went to assist. Lieutenant Max Schneider’s E Company commandeered a squadron of half-track personnel carriers and attacked a French 75mm battery at La Macta. The defenders threw up heavy rifle and machine-gun fire, but the Rangers, aided by supporting fire from a British ship offshore, captured the village. At St. Cloud, Company C, led by Lieutenant Gordon Klefman, encircled the village, charged across a field, and pushed the defenders back. Klefman was mortally wounded, and his last command was: “Keep going! Keep going to the right and don’t worry about me.” The French surrendered around midafternoon. When the fighting around Oran and Arzew ended, the Rangers felt they deserved a rest, but Colonel Darby disagreed. He thought they needed more training, so for almost three months they practiced night fighting, speed marching, mountain climbing, and amphibious landings. Darby devised a way for his men to maintain contact in the dark by using flashlights with pinpoints of different-colored light. The soldiers groused, wondering if they were going to spend the rest of war in training. Then, on February 1, 1943, the battalion was ordered to stand by for action. The Allied command in central and southern Tunisia needed information about the movements of German troops retreating from Tripolitania, particularly the identification of German and Italian divisions. Darby’s men climbed aboard 32 C-47 transports at Oran and flew to the Youks-les-Bains airfield near Tebessa. German planes bombed the airfield as the last truckload of Rangers left for the Tunisian front. The trucks hauled the soldiers to a French outpost 20 miles west of their objective: a German-supported Italian strongpoint guarding the Sened Pass, where the road to the coast (at Sfax) runs between the Majoura and Biada Mountains. The Rangers were to raid three enemy positions in the Sened area, capture prisoners, and inflict as many casualties as they could, making the enemy think that Allied strength was greater than it actually was. On the night of February 11, 1943, Darby’s battalion marched across the boulder-strewn slopes of the central Tunisian mountains toward Sened. Their faces were blackened, their boots saddle-soaped to prevent squeaking, and their dogtags taped down. They moved silently and swiftly, guided in the darkness by their red and green pinpricks of light. They bivouacked at dawn in a bowl between two peaks, having covered 14 miles in just over two hours. The Rangers hid among the rocks during the day, and after dusk they moved down the slopes. The moon was bright. The Americans could hear enemy tanks and trucks rumbling along the road through the pass. The Rangers filed across the plateau around midnight. The moon set, and the desert became dark. The Americans scrambled silently up a rocky hill toward the Italian strongpoint, and at 2 am the companies formed a skirmish line. Darby, his blackened face glistening with sweat and his uniform tattered, used a radio set to monitor his companies’ progress. As his men moved to within 200 yards of the enemy position, the Italians sensed danger and opened fire. Blue tracers crisscrossed over the Americans as they crawled forward on their bellies. Fifty yards from the wire, A Company on the left flank was fired on by a machine gun. The Rangers heard nervous sentries calling, “Qui va la? Qui va la?” (“Who goes there?”). A 47mm cannon began raking the ground in front of the Rangers and then other guns opened up. Darby’s men crawled forward until they were below the Italian guns. The Americans tossed hand grenades and screamed and shouted. They scrambled up the final slope, blasting with rifles and Tommy guns, and jabbing with bayonets. Corporal James Altieri lost his footing and slipped into a slit trench occupied by an Italian soldier. The American whipped out his commando knife and jerked it into the man’s belly. He screamed and fell. Warm blood spurted over Altieri’s hand, and he turned away and vomited. Six supporting mortars hammered the Italian position. Bedded down for the night, most of the enemy had been surprised. Many streamed from their tents, some tried to mount motorcycles and ride away, and others begged for mercy. The Rangers cleared the hill and captured 11 soldiers of the 10th Bersaglieri Regiment. The Americans destroyed six cannon and a dozen machine guns and gained useful information from the prisoners about enemy dispositions in Tunisia. More than a hundred Italians lay dead at the Sened Pass, while Darby lost only one man dead and 18 wounded. 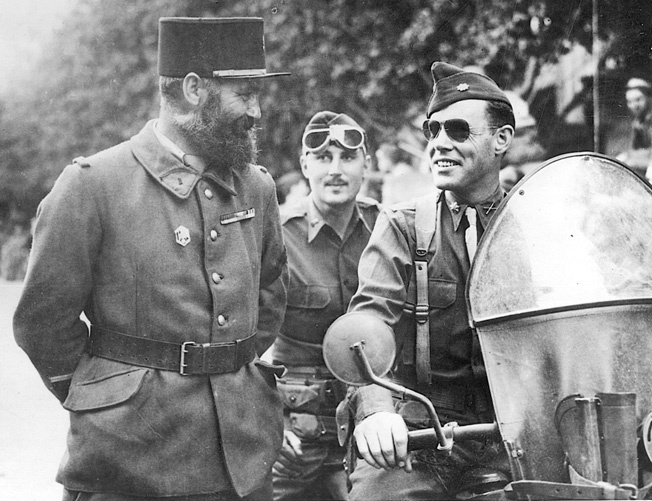 Lt. Col. William Darby (right) talks with French soldiers wearing the distinctive kepi and a full beard at the height of the campaign against the Germans in North Africa, December 18, 1942. Their mission accomplished, the Rangers rounded up their captives and prepared to withdraw. The 18 wounded Americans were placed on improvised stretchers slung between rifles. The Ranger code decreed that wounded were to be left behind after a raid if they were likely to delay a withdrawal, but Colonel Darby had no intention of adhering to the rule. The battalion formed two columns and made its way down the ravines in the dark. The men took turns carrying the wounded, and what little water remained was given to them. Dirty, weary, hungry, and thirsty, the Rangers struggled on, with Darby encouraging them: “Keep pushing, keep pushing!” He feared that they might be cut off by enemy tanks. The Americans made their way to the cover of mountains 12 miles away, and eventually to the French outpost, now guarded by British armored cars. Darby was again proud of his men. They had defeated both the enemy and the inhospitable desert and had earned from the Italians the nickname “Black Death.” General Fredendall awarded the Silver Star for gallantry to Darby, four of his officers, and nine enlisted men. On February 14, 1943, German panzer columns punched through the American lines in the Kasserine Pass area, sending the inexperienced U.S. II Corps reeling. The Rangers covered the corps’ withdrawal, and British Guards and armored units went to the rescue. Eventually, the U.S. 1st Armored and 1st Infantry Divisions were able to regroup and stabilize the lines. For several weeks Darby’s Rangers patrolled, took 30 prisoners, and defended the Dernaia Pass until the Battle of Kasserine was over. On March 1, the Rangers were ordered to the village of La Kouif for rest and refitting. Meanwhile, Maj. Gen. George S. Patton, Jr., had taken over and shaken up II Corps, which was expanded and ordered by the British First Army to mount an offensive to divert enemy reserves from the Mareth Line and to seize airfields from which the hard-fighting British Eighth Army could be supported. The British were making the main Allied effort in Tunisia. The II Corps was to capture Gafsa and then move toward Maknassy to threaten the enemy line of communication from Gabes. The Rangers were to spearhead the 1st Infantry Division by clearing concealed enemy positions in the mountains east of El Guettar on the road to Sfax. At La Kouif, meanwhile, Colonel Darby had become sick and periodically delirious. His executive officer, Major Dammer, made plans for the march to Gafsa. The Rangers moved out on the night of March 13, 1943. Darby, not about to miss a fight, left the hospital and rejoined his unit, though still sick and doped with sulfa. His men dug foxholes at Gafsa and waited in the olive groves while American armor and artillery units moved up. The 1st Armored Division rolled into the northern battlefront over the rutted track leading to Maknassy, while the southern front was left to the Big Red One and the Rangers. Darby’s soldiers strapped on their light packs and strode out toward the mountains. They scrambled up the slopes in the dark and in two hours approached El Guettar. No lights showed in the town on that night of March 18, although they believed there were 2,000 enemy troops there. The Rangers would be outnumbered four to one. Scouts approached the town warily, and reported that it was empty. The enemy had withdrawn to the heights because of the advance of II Corps. The Rangers occupied the town. Darby was now ordered to seize the pass at Djebel el Ank so that General Allen could anchor his Big Red One’s left flank on the mountain that separated the areas east and southeast of Gafsa into two battle arenas. The Rangers would attack the pass as a spearhead for a battalion of the 26th Regimental Combat Team. As the 1st Division moved more men, guns, and ammunition forward on March 19-20, Ranger patrols scouted the peaks overlooking El Guettar for possible flanking routes to Djebel el Ank. After sundown on March 20, Darby’s men left El Guettar and headed westward toward Gafsa. Accompanied by their attached engineers and infantry, they climbed steep rocks and a mountain track. It was 12 miles to the pass at Djebel el Ank. The moon shone brilliantly and then disappeared. Mortar tubes and their bases clanked, but the hard-breathing Rangers moved silently. As the sun began to rise, they reached a plateau overlooking Italian positions. At 6 am on March 21, Darby’s men opened fire on the rear of the Italian emplacements. Rifles cracked, machine guns clattered, infantry mortars thumped, and shells boomed in the valley. Gray smoke wafted across the mountains. A German 88mm gun opened up on the Rangers’ silhouetted command post, and Darby sent two squads to silence it. The Rangers then formed a skirmish line and, howling American Indian war cries, dashed down toward the Italians. Running, crouching, and jumping from boulder to boulder, the Americans knocked out one enemy gun position after another, while other Rangers attacked up the valley to clean out strongpoints. The Rangers charged the Italians without cover, but were stopped by a fortified machine-gun nest. It was now 8 am, and they had no mortar rounds left. Then the engineers arrived and one of their 81mm mortars blasted the position. The defenders were overrun, and the 26th RCT arrived at Djebel el Ank at 10 am. The Rangers mopped up and took 200 prisoners, a motley group of Italians in ankle-length overcoats. The Germans had pulled out and left them two days before. Many of the Italians were persuaded to surrender by the 1st Ranger Battalion’s Roman Catholic chaplain, Father Albert Basil, who wore the green beret of a British Commando. At 2 pm that day, Colonel Darby reported to the 1st Division that the valley was in American hands. The Rangers held the heights as the Battle of El Guettar raged for 21 days. Several companies went down to the plain to support two battalions of the 18th Infantry Regiment, which were cut off from the rest of the Big Red One. The Rangers, in turn, were almost cut off, but they did not yield an inch to the Germans. U.S. Army Rangers move themselves and an array of military equipment into landing craft prior to the beginning of Operation Torch. This photo was taken on November 6, 1942, two days before the landings on the African continent. Next came Operation Husky, the July 1943 invasion of Sicily. Three U.S. divisions spearheaded by Rangers were to land on the south coast of the Mediterranean island and drive northward across the western part to the port of Palermo. Four British Eighth Army divisions and Commandos would land on the southeastern tip and advance northward up the east coast to Messina. The Rangers had grown by now. Darby commanded the 1st and 4th Battalions, Major Dammer led the 3rd, and a fourth—the 2nd Battalion—was training in the United States. Before the invasion, the Rangers underwent more amphibious training at Algiers and Bizerte. At dawn on July 9, 1943, the invasion force, comprising 130 Allied warships and 324 vessels laden with troops and equipment, put to sea. The ships rendezvoused in the Tunisian channel and steamed eastward to Sicily. Shortly after midnight on July 10, the British and American assault troops began clambering into landing craft as they rocked in the choppy seas. Major Dammer’s battalion splashed ashore near Licata on the flank of the U.S. 3rd Infantry Division. The landing was initially unopposed, but then enemy machine guns and 47mm guns opened up on the Americans from the rocks overlooking the beach. Dammer’s men scrambled to the enemy positions and seized them one by one. 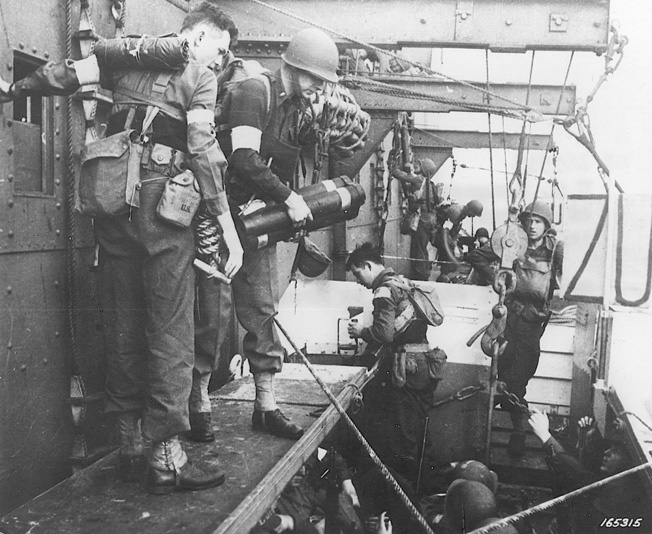 As Darby’s battalions headed for the beach at Gela, the Italian defenders switched on six searchlights and fired depressed antiaircraft guns toward the landing craft. Red and blue streaks of fire flew into the boats, and seasick Rangers vomited and groaned. An Allied rocket ship fired back and hit an ammunition dump in the town. Twenty-eight assault boats hit the beach, and Darby’s soldiers jumped out, ran across the beach, and hugged the seawall. Supported by mortar fire, the Americans then pushed into Gela. The 1st Battalion swung to the left and the 4th to the right, leaving the town center to an engineer battalion. Warily and with grenades ready, the Rangers moved through the darkened streets toward a fort on the town’s flank. Darby called for the cruiser USS Savannah to shell the citadel, and then his men captured it. German fighter planes strafed the Americans, and a Ranger sergeant managed to shoot down a Messerschmitt 110 with his Browning Automatic Rifle. Around 7 am, six Italian tanks clanked into Gela. Rangers worked their way onto rooftops and tossed sticky grenades down on the tanks. Others fired rocket launchers at point-blank range, threw grenades, and even tried dropping 15-pound blocks of TNT. The Rangers also used a 37mm antitank gun that was hauled frantically from one street corner to another, taking potshots at the tanks. Colonel Darby spotted an Italian tank rolling along the main street toward the city square. His driver swerved his jeep into an alley, and Darby swung its machine gun around and fired a belt of rounds at the tank. The bullets bounced off harmlessly. Darby then sped off in the jeep to find the antitank gun, hitched it to the jeep, and dashed back to the square. Bareheaded and with his sleeves rolled up, he helped Captain Charles Shunstrom hastily wheel the gun into position. They fired several shells and flamed the tank. Bazooka rounds knocked out the second tank, and a pole-charge dropped from a building demobilized the third. When the other tanks were also hit, the Italians withdrew. The gallant and quick-thinking Colonel Darby was awarded an oakleaf cluster to his DSC. The Rangers fought on that morning against snipers and pillboxes. Around noon, 18 big German Tiger tanks rumbled into the town for a second counterattack, and things looked desperate for Darby’s outgunned men. He called for support from chemical mortars and the Navy. Shunstrom used a captured 77mm gun against the enemy tanks, and 12 of them were blasted out of commission. Then a battalion of Italian infantry approached. The Rangers let them advance to within about 2,000 yards and then poured 4.2-inch mortar rounds into them. The Italians fled. By late afternoon Gela had quieted down, and the weary Rangers were able to liberate a supply of cognac and champagne from a restaurant. Two days after the landings, Darby’s men advanced northwest from Gela to attack San Nicola. The spearheading Rangers and the Big Red One fought for 50 sleepless hours, through bombings and tank and artillery attacks, before pushing northward to assault the fortress of Butera perched on a 4,000-foot hill. With artillery support, two platoons under Captain Shunstrom managed to take the citadel, which could have been held against a division. Major Dammer’s battalion, meanwhile, had captured Licata and Port Empedocle and moved on to other objectives. Allied reinforcements were landing from the sea and air. The British Eighth Army battered its way northward against the main enemy force, while Patton’s Seventh Army swung eastward along the road from Palermo. As Darby’s Rangers slogged through the dusty little towns and villages, they perfected the art of house-to-house fighting. Virtually every stone house was a fort that had to be stormed. Darby tried to even the odds for his men by getting hold of half-dozen 105mm self-propelled howitzers and later forming the 18-gun Ranger Cannon Company. His leadership became an Army legend, and his concern for his men never flagged. “His optimism and confidence were the source of the Ranger spirit which translated into ‘it can be done,’” reported Dammer. Captain Murray, who had led the Rangers at Dieppe, said, “Darby believed he could lead anyone into combat and bring him back safely.” Darby refused to leave his Rangers, turning down the offer of a full colonelcy and command of a combat team in the 45th Infantry Division. Lt. Col. Darby, commander of the Rangers, confers with Major Roy Murray, a battalion commander, in the hells west of Salerno. By August 17, 1943, the Allies had secured Sicily. The hard-fighting Rangers’ uniforms were in tatters, their shoes worn thin, and most of their gear was ready for salvage. Only their weapons and morale were still in good shape. There would be little respite for them before their next assignment: the Allied invasion of mainland Italy. That September, the Eighth Army crossed the Straits of Messina to the Italian toe and started pushing up the long peninsula. Lt. Gen. Mark W. Clark’s U.S. Fifth Army landed on the west coast below Salerno at dawn on September 9. The main Allied landing was set for the beaches 15 miles below Salerno and 45 miles south of Naples. Darby led a mixed U.S.-British force of Rangers, Commandos, U.S. paratroopers, gunners, tank units, and engineers ashore. Their assignment was to seize and hold the scenic Sorrento Peninsula west of Salerno. The force was to capture strategic passes overlooking the Naples plain and ease the way for British and American units when they moved up through Salerno and Nocera. 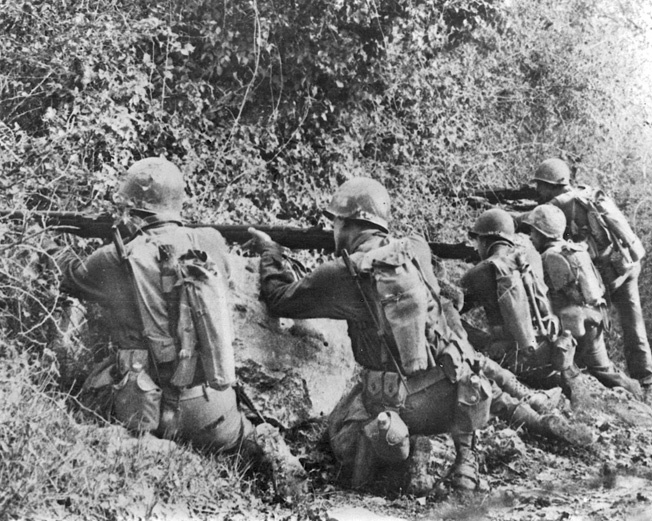 The Rangers were to observe German concentrations in the Naples plain for the naval gunners and prevent the enemy from mounting a flanking attack on the Salerno beachhead through the 4,000-foot Chiunzi Pass. His men pinpointed enemy targets for Allied artillery and naval batteries. One observer spotted Germans issuing ammunition in a park near Nocera and called in a barrage from a Royal Navy battleship. One 15-inch salvo touched off a series of huge explosions. 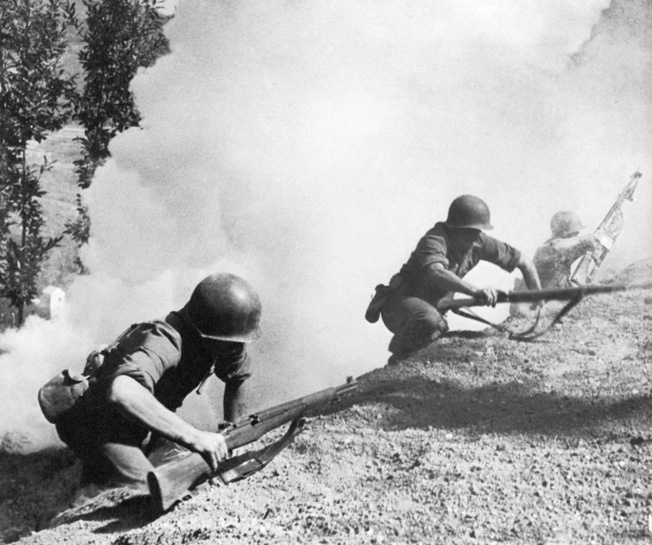 U.S. Rangers scramble up a hillside near Chiunzi Pass under a smoke screen. The Rangers and British observers used a stone-walled farmhouse near the crest of the Chiunzi Pass, nicknaming it “Schuster’s Mansion” after Captain Emil Schuster, who had set up a medical aid station there. Targeted by naval gunfire, the Germans repeatedly bombarded the pass, but the command post was sturdy enough to withstand hundreds of direct artillery and mortar hits. The Rangers’ mission would have been a routine one if the main Allied force had arrived on schedule, but it took three weeks before the main drive could get started through the gap to Naples. Darby’s men were out on a limb for 21 days, lacking enough field guns for adequate defense and outnumbered by the enemy at least eight to one. Nevertheless, they held on, beating back seven large-scale attacks by German mountain troops and Waffen SS units. The Americans huddled in foxholes hacked in the mountainsides and withstood relentless mortar and artillery barrages. Strung along a nine-mile front, the two Ranger battalions deployed four half-track howitzers against the deadly enemy 88mm guns. ‘We held on by our fingernails,” said one Ranger. “We were spread so thin that we had a hell of a time stopping the Germans. But we did, thanks to our speed, versatility, and rugged training. When the Germans came up the hill, we’d all rush over to plug the gap and let them have it.” Four- and seven-man patrols crept out at night to probe the enemy’s strengths and weaknesses and to bring back prisoners for interrogation. Meanwhile, the 4th Battalion had captured Amalfi, swept across the Sorrento Peninsula, and occupied Castelammare on the Gulf of Naples. Shot at from all directions, Darby’s men clung to the Chiunzi Pass. They were exhausted, but the price was high: Many had contracted malaria in Sicily, and some Ranger units suffered up to 30 percent casualties. The wounded were trucked down to Maiori, where Royal Army Medical Corps doctors performed surgery 24 hours a day in a monastery chapel. Italian nuns and nurses tended the wounded soldiers. The survivors at the pass ran short of food, water, and ammunition. Finally, the Allied forces broke out of the Salerno beachhead and stormed up Highway 18 toward Salerno. The Rangers were then able to pull out of the Chiunzi Pass and head for Castelammare. They pushed rapidly past historic Pompeii and Mount Vesuvius, followed airborne troopers into Naples, and fell asleep in the botanical gardens. They went into bivouac, but just as they were beginning to relax, they were ordered back into the mountains. After action at Venafro, near Cassino, they returned to Naples for the 1943 Christmas season. Darby tried to lift his weary men’s spirits with good food, wine, whiskey, dances, movies, and USO shows, and Father Basil returned to conduct Masses for them, at the same time good-naturedly fining them for their soldierly profanity. With the start of the new year, the Rangers began intensive training at Pozzuoli for a new operation, the Allied invasion of Anzio. Supported by engineer, mortar, and airborne units, the three battalions were to land directly in front of Anzio, burst into the town, and sweep out to occupy a half-moon of beachhead territory. At midnight on January 22, 1944, Darby’s men disembarked with the U.S. 3rd Infantry Division from British ships south of Nettuno and rode landing craft to the pier at Anzio. Darby’s 1st and 3rd Battalions landed unopposed, and the 4th followed. The Rangers fanned out through the town, and some moved on to Nettuno. Darby set up a command post in the Anzio casino. Enemy resistance was scattered and by dawn the Rangers had carved out their beachhead. On the left, the 3rd Battalion linked up with the Scots Guards of the British 1st Infantry Division. Darby’s men patrolled while Allied reinforcements poured ashore and German resistance stiffened. The enemy counterattacked, but the Rangers and the British held firm. On the night of January 28, Darby’s force was relieved by a British reconnaissance unit, and the Americans marched back to an assembly area near Nettuno. Something big was coming up. 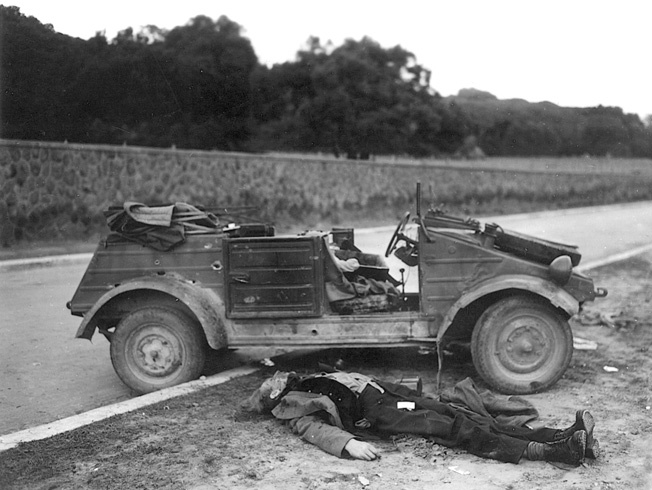 A dead German soldier sprawls next to his vehicle near the Anzio beachhead. Soldiers of the 1st Ranger Battalion caught the victim in an ambush. For a week, General John P. Lucas, commander of the U.S. VI Corps, had consolidated the Anzio beachhead. But he was a cautious officer, more interested in putting the harbor into operation and building up strength than in breaking out and mounting an offensive. General Clark prodded him to get moving, and by January 29 Lucas felt ready. While the British 1st Armored Division made the main effort toward Albano, the U.S. 3rd Infantry Division, spearheaded by two Ranger battalions, was to take the town of Cisterna di Littoria on the Appian Way, thereby cutting strategic Highway 7. Darby was ordered to infiltrate his two battalions into the town during the night of January 29, with the other battalion clearing the road for armor and infantry the following morning. Leadership of the Rangers had been diluted. Darby and Major Dammer were assigned to force headquarters, and the 1st and 3rd Battalions were now led by Major Jack Dobson and Major Alvah Miller, respectively. Darby had misgivings, believing that the Rangers’ combat effectiveness had been weakened. The Rangers arrived at an assembly area at San Antonio before dawn on the 29th. Due north about eight miles was Cisterna, a cluster of stone and cement houses on the Appian Way. It was about four miles outside the beachhead in enemy territory, but the front was fluid and there were no signs of German concentrations. Actually, the enemy had gathered considerable strength in Cisterna in readiness for a counterattack on February 2. The Rangers spent January 29 in bivouac, resting, cleaning and oiling their weapons, sharpening bayonets and trench knives, and getting haircuts. After a quick supper at nightfall they were ready to move out. Riflemen carried extra bandoliers of ammunition and hand grenades stuffed in their pockets, while the mortar crews carried three rounds for each weapon. There was a plentiful supply of sticky grenades and bazookas, but the machine guns were left behind. The Rangers were accompanied by a tank destroyer company, a cannon company, and the 83rd Chemical Mortar Battalion. In good spirits, Darby’s Rangers strode out for a seven-mile hike to the line of departure. It was a cold and moonless night. At midnight, the three battalions and accompanying troops reached a road junction about four miles from Cisterna. Darby called a final conference with his subordinate commanders, and at 1:30 am, the soldiers started for Cisterna. They moved in a column through deep irrigation ditches leading northward. The Rangers crept silently past German sentries. There was no gunfire and no challenges. The Americans plodded on, listening to orders barked at nearby enemy machine-gun positions. There was no sign that the Germans knew their defenses were being breached. While the 1st and 3rd Battalions moved through the ditches, the 4th Battalion on the left flank ran into determined resistance from farm buildings, emplacements, and a roadblock. Half a dozen medium tanks rolled up to support the battalion, but all night it had a running fight. By dawn, the 4th was still short of its objective, Isola Bella. About two miles from Cisterna, the 1st and 3rd Ranger Battalions, moving single-file, lost contact and were strung out for a mile and a half. Major Miller was leading the 3rd Battalion when a German tank suddenly loomed around a bend and opened fire. The Rangers returned fire immediately, but the leading Americans were killed or wounded, and Miller died. The tank was demolished with a sticky grenade, and the battalion hastened to catch up with the 1st. The Rangers thought they had surprised the Germans, but it was really an ambush. When they climbed out of the ditch to deploy for the assault on Cisterna, the Americans were blasted on all sides from snipers, machine guns, mortars, and howitzers. Darby’s force had run into the crack Hermann Göring Panzer Division and the 4th Parachute Division. Tank guns swung toward the Rangers, who by now were surrounded. They broke up into small groups and fought until they dropped. There was no pulling back. As the sun came up, the Rangers found themselves exposed in front of Cisterna, where enemy snipers and mortars picked them off from farmhouses. Major Dobson, leading the 1st Battalion, was seriously wounded. The Americans demolished several German tanks with bazookas and sticky grenades, but more armor and enemy infantry appeared. Some of the Rangers hurled themselves onto the tanks, exploding them—and themselves—with sticky grenades. Others used bazookas to blast off the tank treads while riflemen shot the crews that emerged. But it was a losing battle, and Darby’s men were being slaughtered. At 8:30 am, the 1st and 3rd Battalions radioed back that they were surrounded and had suffered heavy casualties. They fought desperately against heavy odds for five hours. The 4th Battalion tried to push through to them but was held up at the hamlet of Femina Morta (Dead Woman). Colonel Darby listened with frustration to the calls for help, but his headquarters at Femina Morta was also surrounded. The fighting continued that afternoon, but the Germans began rounding up the Rangers. Eight made a dash for the irrigation ditch, but shells and sniper fire bracketed them. Only two Rangers managed to get through the German lines. Of the 1st and 3rd Battalions, only six men escaped from Cisterna. On January 31, a regimental combat team fought its way up to the 4th Ranger Battalion, and together they cleared the enemy from Femina Morta. Although the gallant action at Cisterna had helped to save the Anzio beachhead from counterattack, Darby blamed himself for the disaster. The Germans had seen his men coming, and Darby believed that the outcome would have been different if he had been with the forward columns. When told that his men could not pull back because they were cut off, Darby had “put his head down on his arm, and cried … he broke down,” reported his jeep driver, Sergeant Carlo Contrera. 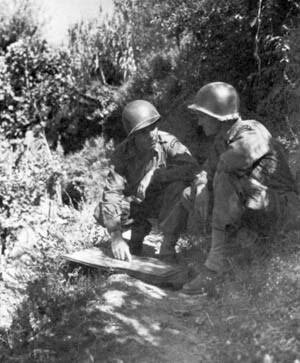 Slugging their way through the mountains of Central Italy, U.S. Rangers lay down covering fire from a well-concealed position as other members of their squad execute the technique of fire and maneuver. The destruction of the 1st and 3rd Battalions at Cisterna was the result of faulty Allied intelligence and good planning by the Germans. A captured German officer stated later that the town had been reinforced on the night of January 29. A Polish deserter from the German Army had tried to explain to the Rangers about the enemy buildup, but no one could understand him, and he was evacuated to the rear. Before their ranks were broken up and they were ordered home for a long and well- deserved rest, Darby’s surviving Rangers had been awarded the Silver Star, the Purple Heart, the Combat Infantryman Badge, the blue-and-gold Presidential Unit Citation, a number of Distinguished Service Crosses, and British, French, and Russian decorations. They were proudest of their citations for teamwork. Darby himself had received the Distinguished Service Cross, the Silver Star, the Legion of Merit, the Purple Heart with two clusters, the Croix de Guerre, the Soviet Order of Kutuzov (third degree), and the British Distinguished Service Order. By Darby’s count, there were only 87 remaining out of the original 500 Rangers who had trained at Achnacarry. Officers and men became instructors at several Army camps, and new Ranger battalions carried on the gallant tradition forged by Darby’s original units. In the great Allied invasion of Normandy on June 6, 1944, Lt. Col. James E. Rudder’s 2nd Ranger Battalion distinguished itself by scaling 100-foot cliffs under fire at Pointe du Hoc to destroy German guns that could have threatened Omaha Beach and Allied ships in the English Channel. The 5th Ranger Battalion fought gallantly in France, Belgium, and Germany, and the 6th Battalion served in New Guinea and the Philippines, where it spearheaded the drive on Manila and rescued American prisoners from behind Japanese lines. Colonel Darby was slightly wounded by a bomb fragment on the night of February 15, 1944, and was relieved. He was given command of the battered 179th Infantry Regiment of the 45th Division, which had fought in the bloody Anzio Campaign for two months. In April 1944, Darby was sent home and assigned to the Operations Division at the War Department. He supervised training programs, was reunited with the survivors of Cisterna, and visited many bases to assess the quality of troops being trained for overseas duty. But he disliked staff work and repeatedly asked for an assignment in a combat theater. 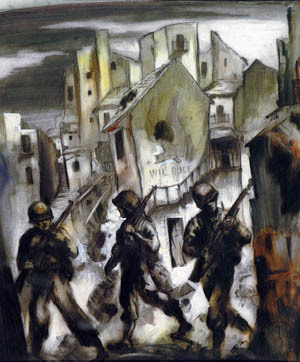 In a gloomy painting of war on the Italian front, American soldiers trudge through a bombed-out village. The U.S. Army Rangers, led by Lt. Col. William O. Darby, fought gallantly in Italy but were decimated in an ambush near Cisterna. In March 1945, Darby was sent on a 90-day tour of the European Theater to evaluate air support of ground units. Then he made his way to Italy to visit the 10th Mountain Division, where he succeeded Brig. Gen. Robinson E. Duff as assistant commander when the latter was wounded and evacuated. The division was campaigning east of Lake Garda in northern Italy to try and head off Wehrmacht units retreating into Austria. Late on the afternoon of April 10, 1945, Darby was standing with a small group of officers outside their command post at a hotel in the town of Torbole. Suddenly, a round from a German 88mm antiaircraft gun exploded 30 feet from the group at the side of the hotel. All the officers were hit by shell fragments, and Darby received a dime-sized fragment in his heart. Two medical corpsmen laid him gently on a cot, but he died two minutes later. The U.S. Army had lost one of its outstanding combat leaders of World War II. Michael D. Hull has written numerous biographical accounts of World War II commanders. He is also a contributor to the forthcoming Eisenhower Center for American Studies World War II Desk Reference. Tags Achnacarry, Allies, Anzio, Army Rangers, Axis, Battle of El Guettar, Bonnie Prince Charlie, Charles Vaughan, Cisterna, Distinguished Service Cross, Djebel el Ank, European Theater, General George S. Patton, Hermann Göring, Italian Campaign, kasserine pass, Lloyd Fredendall, Lord Louis Mountbatten, Mediterranean, Messina, Naples, Nazi Germany, Operation Husky, Operation Torch, Rangers, Robert Rogers, Tunis, Tunisia, USS Savannah, William Darby.